A typical writing day, doesn’t look typical, especially if you’re a teacher, mother, professor struggling to make time to even get a break, but between breakfast, and laundry between lunch, groceries, and grading sometimes things get written and submitted. 6:30am after thinking of what I have to do and getting in a few minutes of thinking about where I need to submit to, or poems I want to write or essays that are halfway finished, I get up finally and rush to get ready and get me and my son out the door. 7:15am without fail, my son needs to handle business before we can really leave. 7:30-8am I have thirty minutes to think about writing and life as I drive to work. This only works if I’m not thinking about teaching. Some days my son will say something or do something that inspires, sometimes it comes in the drive, sometimes inspiration comes from the weather, whatever it is, I vow not to forget and write it down as soon as I park unless I’m in a rush. Then I’m usually sad I forgot, forget that I’m sad, eventually it comes back. 8am-12:11pm teach until lunch. I love teaching. I teach Chicano/Latino Studies. Somewhere in there I drove from my 1st school to the 2nd one. Maybe took a restroom break. Maybe. By now I’m annoyed with hearing students say “Miss! I have to go to the restroom” or “Miss! Can you repeat that?”for the 100th time by now, but I have a lot of patience. It’s a gift. I write down a couple notes about the day overall if I can, but rarely does that happen in a moment. Most of the time that doesn’t happen until lunch. 12:11-12:20pm mandatory zone out time after students leave. 1pm-1:30 take time for lunch and getting to my last school (I teach at 3 everyday) Coffee at this point is a necessity. Number 2 cup! 3pm-3:30pm wait for traffic to die down and use time to decompress, sometimes write, often more teacher stuff. 8pm-9pm convincing my son “no really it is time for bed kid”. 9pm-10pm Lying down in the same room as my son trying not to fall asleep, tired, but finally time to do what has alluded me all day sometimes I draft poems or essays on my phone. 10pm-12am write, submit, research, catch up with friends or post a new blog post on my blog, sometimes a combination of the two, rarely does it involve more than 2 things. Most days lucky if I can do one. 12am-12:30am fall asleep if I haven’t already. Dream of days where I can write more, but know I have to get up to go to work and sleep deprived teaching is never fun. 12:30am-1:00am Panic if I’m behind in something for teaching. Post a new blog piece if I feel the urge, even though it’s not the most optimal viewing time, but for me it’s the only time and I always forget to schedule posts. 1:05-1:15am Realize how late it is. Try to remember things I forgot earlier, there it is! I think how I should write that down, but always fall asleep before I do. 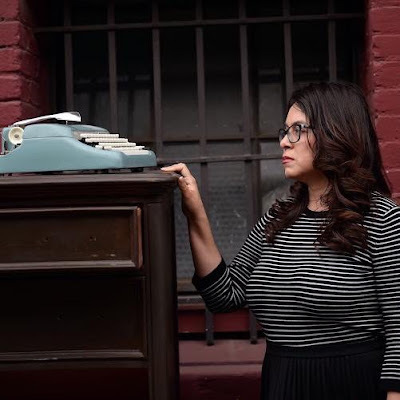 Irene Sanchez is an award wining educator, poet, writer, and public scholar. She has spoken/presented/keynoted at over 50 colleges/universities/conferences. She lives and teaches high school in the San Gabriel Valley of Los Angeles County. She is also Humanities/Education Faculty at Bard College-Los Angeles.